While a query of that variety from my little brother would normally elicit a quick and emphatic yes in the fall, this query was made in spring and our luck with spring snow goose in northeastern SK has never been good. By the time they get to us, they have been well educated, and they don’t stay for more than a day or so and are hard to pattern leading to disappointment nearly every time we have hunted them in the spring. After some hurried investigation into the circumstances surrounding his question, we were all set for an evening of goose hunting. The geese had been doing bit of feeding and lounging on a couple fields near one of the larger snow goose sloughs around and were leaving for the evening feeding to another field about 2 miles away and flying low over a dirt road with trees along it. Aaron had happened to notice this while driving a sprayer back to the farm where he worked. As Aaron was finishing up his work day and would be a few minutes, I grabbed my shotgun, shells, and loaded the chessie in the back, stopped in at my parent’s where I got Aaron’s shotgun and shells and drove to an abandoned yard at the start of the dirt road and waited for him. His daily commute to the farm where he works consist of a 6 mile quad ride down the grid road that would bring him right past the abandoned yard on his way home. As I waited for him the temptation to start without him grew stronger by the minutes as hundreds of snow geese flew right over-top of me at optimum range. Finally, I could hear his quad coming down the road. I was parked off the road and as a result, he did not see me and thought I was still in town and headed into town. “That’s his own fault for not checking if I was here,” I thought as patience abandoned me and I pulled up my shotgun on the next flock of geese and proceeded to not only get a triple, but a quadruple! (**DISCLAIMER** We found one in the field behind the yard after we were done and that was the only shots either of us fired in the yard, so we I can only assume it came from those first 3 shots, he might disagree, but that doesn’t matter) The geese in the field behind immediately got up and moved about a half mile further down and the flight pattern shifted a little further down the road. A couple minutes later, Aaron finally showed up and we headed down the road. Every couple minutes flights would come over but it was windy and the heavily treed road allowance did not allow us more than a second or 2 of warning before we could see them as they came over the trees. Despite those hindrances, we were knocking birds down with regularity; like always, some seemingly easy shots had no effect and shots we thought were desperation shots would crumple the odd bird. The lack of visibility led to several mix-ups on calling out shots. We had 3 birds in front of us that I could see were going to break over the trees at close range and told Aaron to get ready for. He saw some geese behind us that were a little further out, but assumed that I meant them so when I told him to take them, he thought I was crazy and when I started shooting he definitely thought I was crazy but took a shot at them anyways. After inevitably missing, he turned to make a remark to me, disdainful of my spotting and shot calling abilities, just in time to see the last of the 3 geese in front of us falling to the ground after I had managed my second triple of the night. Finally the majority of the geese had passed by and were sitting feeding behind us and we scoured the fields for the last few that we knocked down a ways away. We ended up with 25 out of this spur of the moment hunt and we were quite happy with the result. We were happier still when we found a band among the 25 birds when we were cleaning them. A quick check on the internet showed it to be a 13 year old snow goose that was banded in Queen Maud Gulf in Nunavut. Despite shooting around 1000 birds the last 3-4 years, this was the first band that I can remember since Dad had gotten one when I was likely around 6 or 7. An added bonus and a great ending to this fun hunt! 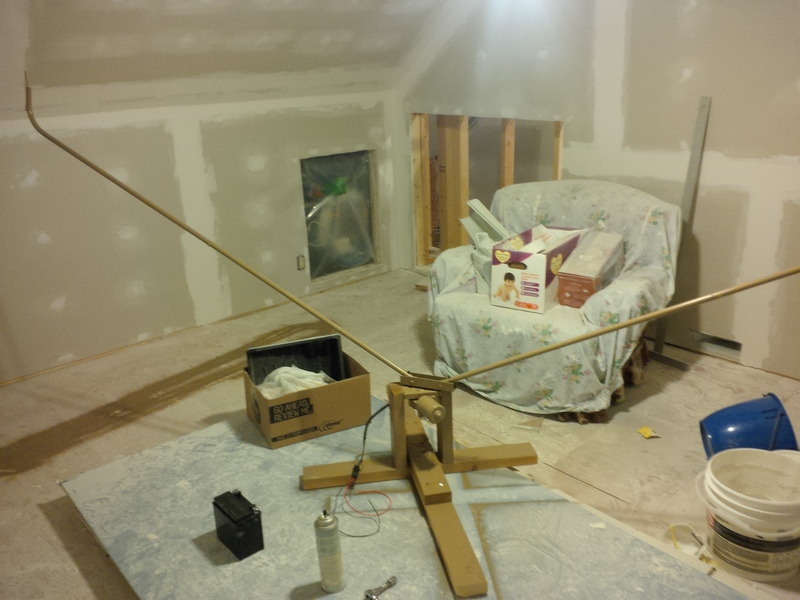 Well after deciding that instead of spending $200 – $300 for a commercial machine, I could likely make my own. I had a coworker who has a totalled truck sitting in his yard and he offered the windshield wiper motor for this endeavor. After an evening scout in his direction, I stopped in at his yard and took out the motor after about 10 minutes and was left with this. After looking at some wiring diagrams and doing some testing, I found the wire that provides the power for the low setting and the ground. I used a piece of paper to make a stencil to cut the holes needed on a piece of plywood. 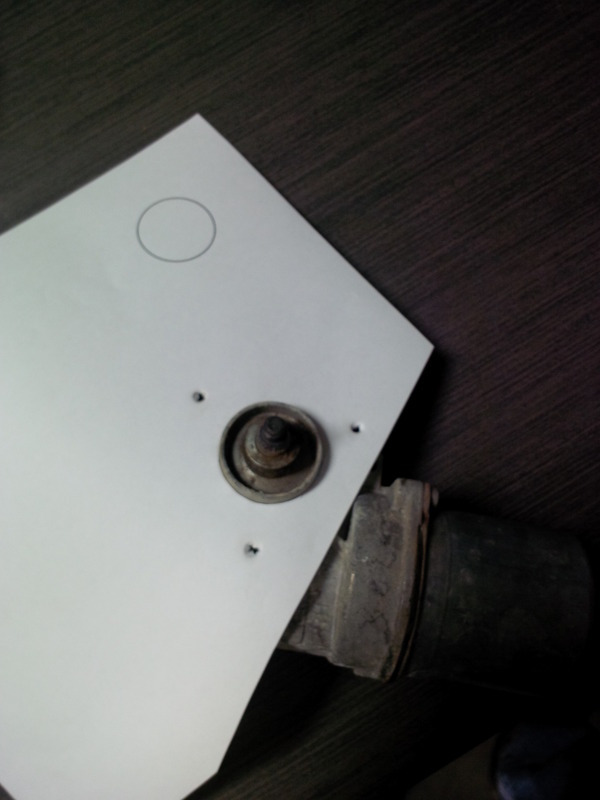 I then cut an appropriate sized piece of plywood and drilled the holes in it to mount the motor. I built a stand with legs on it rather than stakes as I was in a hurry and didn’t feel like trying to find metal and either drilling them out for stakes or doing some welding; I may rebuild it this winter. I found some nice light gauge stainless rods in my dad’s garage and drilled them out to mount them. I used a piece of steel square tubing turned into a U channel for the head and assembled it all together and painted it. Add a motorcycle battery and some wiring and everything was good to go! It works decently enough. 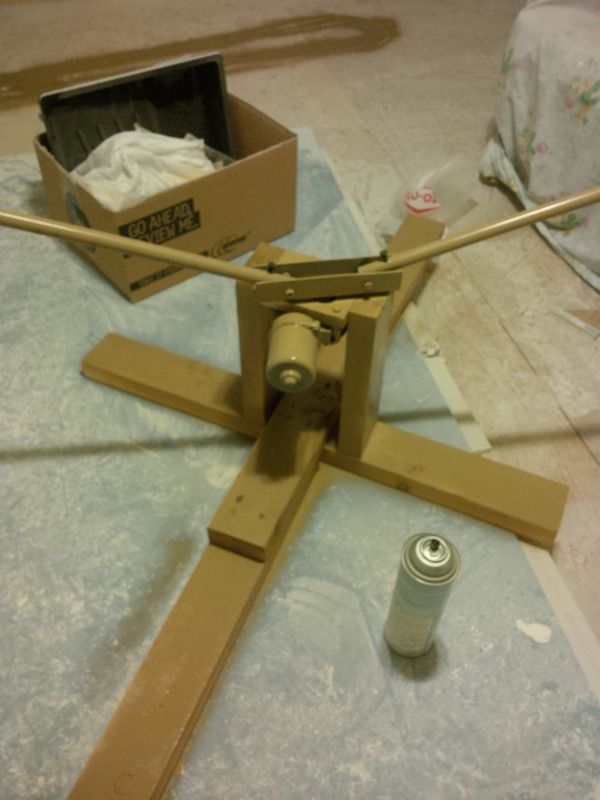 I had to slot the tapered shaft to be able to hold the head without it riding on the nut and loosening the nut. I used some tan paint and painted it all up. The only problem is that the stainless rods don’t hold paint, so may have to do something else with them, like wrapping them or getting them powder coated. 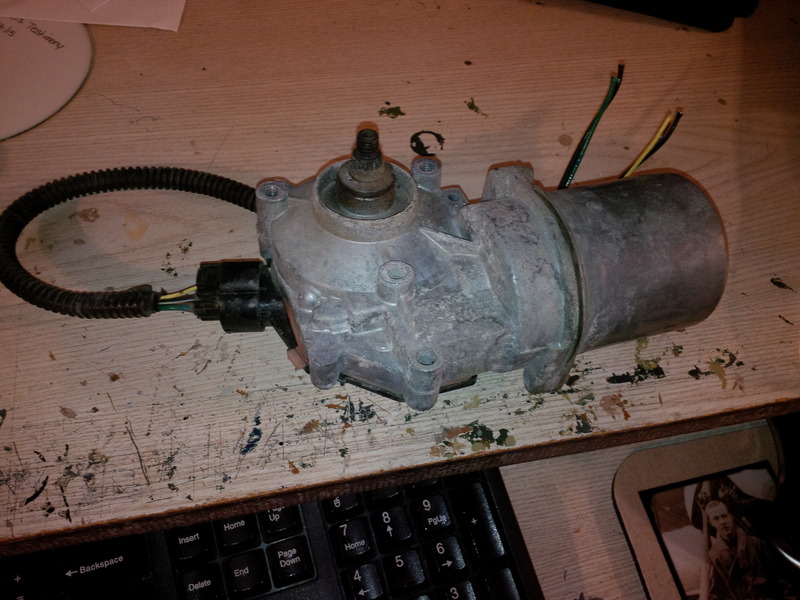 I also need to wire a switch into it, right now I have weatherpack connectors to connect the battery to the motor. All in all, I got about $50 into it including the battery. 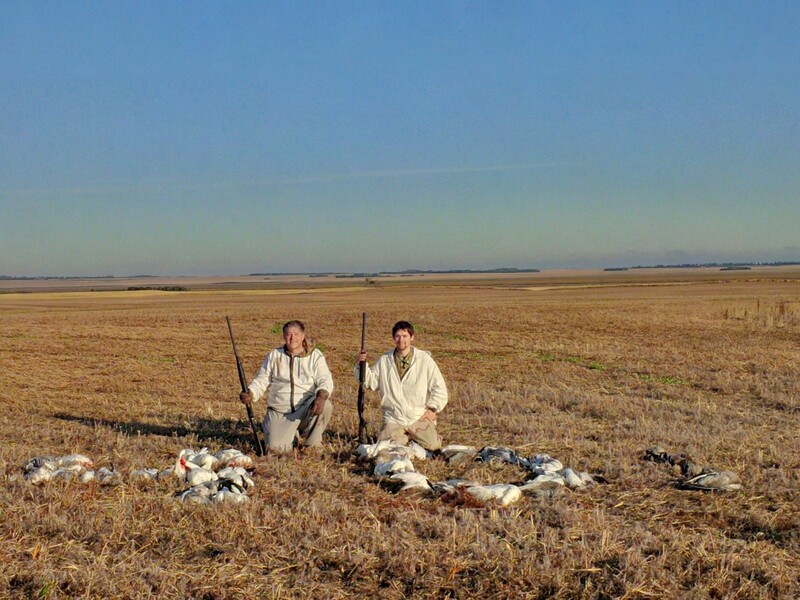 After waiting for a week or better for the snow geese to come in force, I was extremely eager to hunt them the day after they finally showed up. This in spite of the fact that it had been raining for 4 days and was supposed to continue raining another day before the sun finally broke through again. Despite the gloomy forecast, soggy fields and cool temperatures, I headed out to drive some roads to see what I could find. Shortly into my scout, I realized that the roads were really soggy and I took a dirt road I shouldn’t have. I just about didn’t get out of there. First thought: I don’t think the 4×4 is fixed on the truck. Armed with the vital knowledge that things were definitely wetter than I thought, I was forced to avoid roads I normally travel on a regular basis. Of course Murphy guaranteed that the biggest flocks of snow geese were located down those roads. 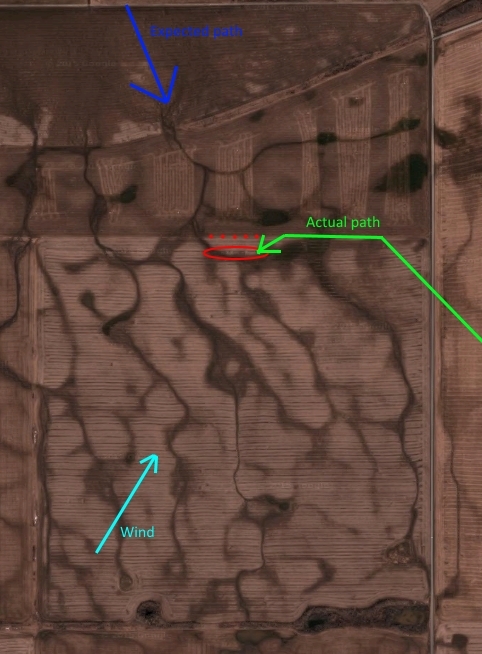 The easiest field with birds on it to access was located a mere mile away from hunters already set up in a field. I realized it would be likely pointless to get permission there with other hunters staring them down across the road. After a quick drive around on what roads that were passable, I decided that the best chance was on a field off of the main grid kitty corner to a field that was occupied by a large flock. I started making plans and lining up some guys to come along. Like flies, they kept dropping out: Little Brother, football game in the afternoon, needs his sleep; Dad, too wet and muddy; family friend David and his son Zachary, had to get a service job finished on a truck in the morning; my buddy Jesse, “Ya I looked at the forecast. And there is no way I’m getting up at 5. Sorry I’m a wus. With weather like this id need to be payed.” After a quick look in my wallet, I realized I couldn’t afford him to come along. At that point in time, I had already loaded my trucks with decoys, hooked up the trailer and quad and had psyched myself up for hunting in the rain and mud. I figured there was no backing out. 4:40 came at the usual time the next morning: way too early. Knowing that I had set up my spread by myself, I got dressed quickly, grabbed my wallet, phone and my gear and headed out the door. I was in the field about 10 after 5 with legal light around 6:05. I quickly loaded up the trailer and hooked it to the quad and headed out. I set up my spread as quickly as possible, I set up a few flyers as well even though there was no wind to speak of. I then set up my e-caller and reached in my pocket for my ipod. “Hmm, not in my pants pockets, must be in my jacket, nope not there either. I had it all set together with my phone and wallet, oh right: I decided not to get it right then as I figured it could stand about 5 minutes more charging…” After a couple of minutes wondering whether I should go back to get it, I hit on a plan. I phoned my wife (who likely hadn’t gotten to sleep yet again) and asked her to transfer a few of my snow goose mp3’s into our dropbox account so that I could get them on my phone and use it instead. A few minutes later my hunt was saved as they showed up on my phone. All in all it was a good hunt with some good shooting. 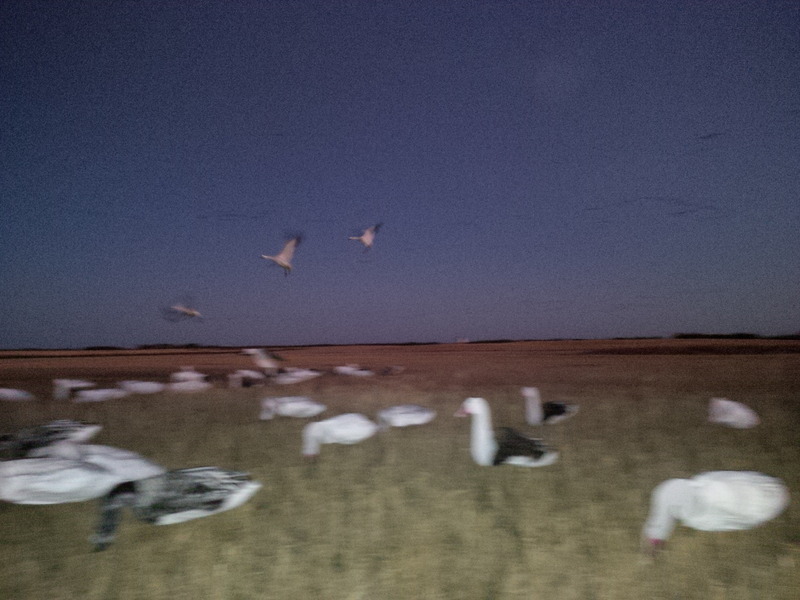 I did not have any snow geese come into the decoys, only Ross geese and the odd Canada flight flying over. I finished off with 12 Ross geese, 4 greenheads (although not yet green, some of them were showing a few green feathers) and 1 canada goose. I had gotten a slight reprieve from work and did not have to be in till 9, but wanted to have everything dropped off and birds cleaned before. I started picking up at 7:15 after an hour of shooting and was out of the field by 8 and cleaning geese at home by 8:15. I finished off cleaning the 17 birds in 15 minutes, cleaned up, dropped off the quad and trailer and was at work by 8:45. As last fall’s hunting seasons closed, it seemed like ages till they would open again. However, the time seemed to fly by and it was already September again. Combines harvesting, the leaves turning color, and the days getting shorter and a bit cooler. I was more than ready to go hunting as the waterfowl seasons opened, but a bad bit of luck kept our initial hunt success low as the geese were roosting too close to the field we had picked for opening day and left en masse when the shooting started. We ended up with 4 and had dropped another in the middle of a standing field of wheat which made it nigh on impossible to find. Later that week we had a disappointing hunt and got skunked. The geese did not seem to be around in the numbers they normally were and what was around was extremely wary. I scouted a few times the second week and despite seeing lots flying during the morning I had a hard time finding where they were feeding in the evening. The odd flock of snow geese were in the area, but it was mostly all the birds that nest here during the summer. I was hoping for a good hunt to setup for on the second Saturday of the season, but it was not looking promising. I was hard pressed to find anything on Thursday night as I only found 2 fields with birds on it and not in huge numbers. WE started driving around on Friday night and after contemplating a field of Canadas we discovered that the sandhill cranes had come back in force. They had occupied a field that I knew very well to be a hotspot for cranes and we estimated upwards of 1000 cranes on the field that night. It was a simple matter to get permission. Here was finally a hunt I could get excited about. 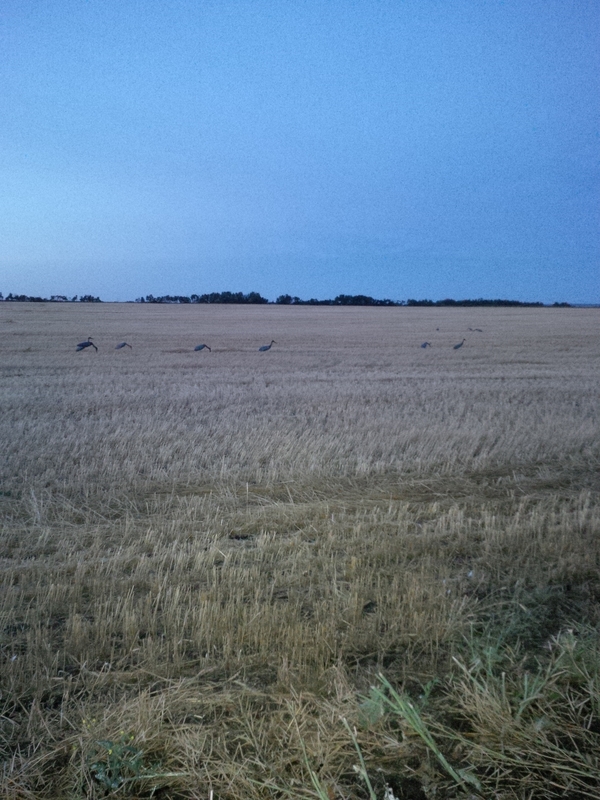 5 of us got up early that Saturday morning and headed out to set up with our 15 sillosock crane decoys. Our best crane hunt previous to this was 3 years ago and had been a quarter mile from here with the birds flying the exact patterns they had been the night before. The setup was ideal: The cranes had been coming from a marshy area to the north of the barley field and flying low over a swathed canola field and were landing on the very edge of the barley field right up next to the canola field. 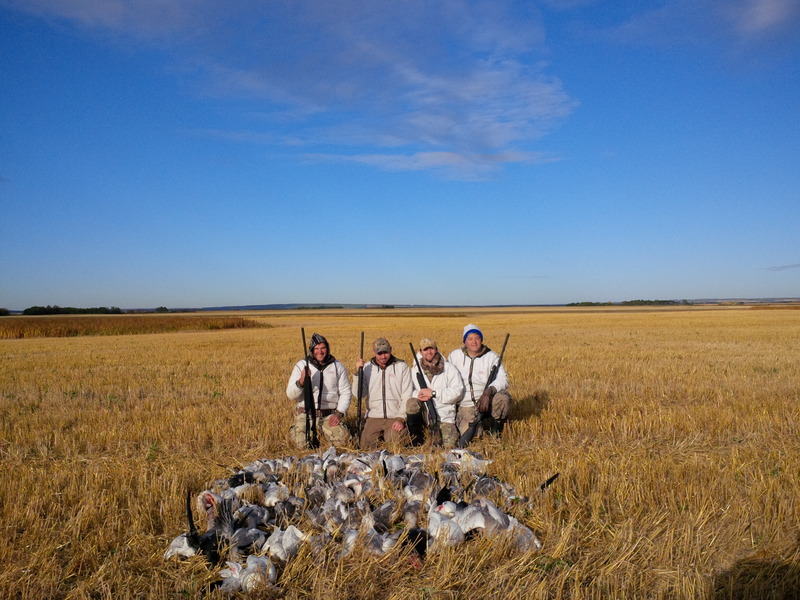 We set up our blinds along the first swath of canola and put the decoys about 50-60 yards into the field, hopefully far enough that the birds would be watching the decoy and not the canola swath. The first birds started flying close to sunrise and my brother knocked down the first loner that came in. To our surprise most of the birds started coming from the opposite direction; from the southeast instead of north. Apparently most of had gone back to the bigger marsh in that direction. We lucked out however as there was a strong southwest wind that forced them to come in down the edge of the canola field. some of them came straight down the swath we had our blinds up against and others would go past a bit and then come straight over the swaths. 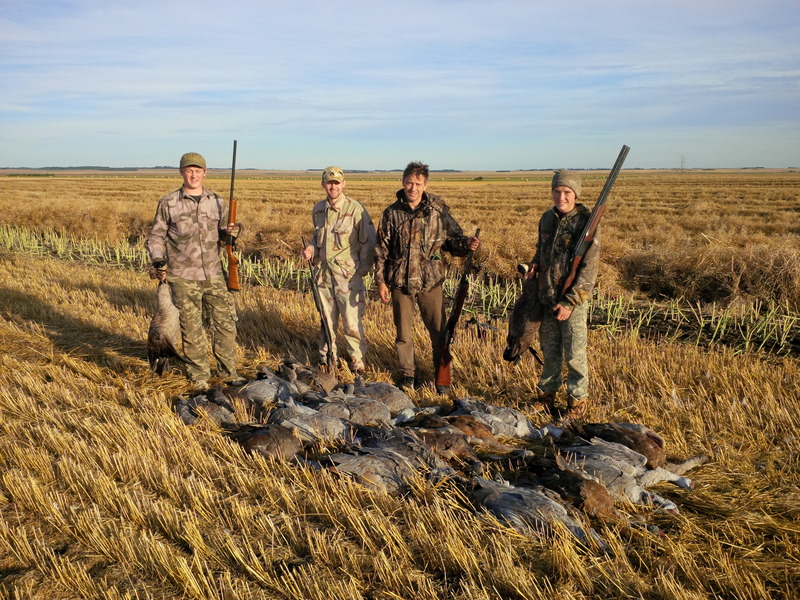 Some of the birds coming down the swath would see us and flare, but the ones coming over the canola swaths were low and did not flare till we would start shooting. The unfortunate part of this arrangement meant that the 2 of us on the east side blinds got a lot more shooting than those on the west side blinds. I had tried to put myself in the spot where there would be the least shooting, as 2 of the guys with us had not shot cranes before, and thinking they would come from the North, thought the the east side would be that spot. I inadvertently set myself up for a lot of shooting. A few flights came in and we knocked several down. We had 2 canadas converge with a flock of cranes right when everything was in shooting range and my little brother and I took the canadas while the others concentrated on the cranes. As the morning went on, the cranes were landing on the field to the north of the canola field and drawing most of them away. 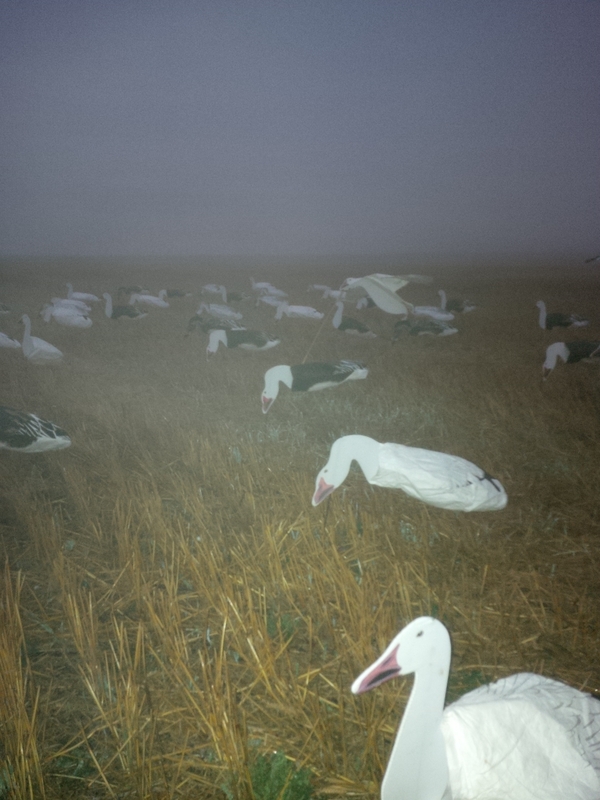 However there were still flights that wanted to land on the barley field with our decoys. I had shot 3 cranes and the 1 goose when we had a flight come right on top of us no more than 10 feet off the ground. As they flared no more than 25-30 feet from us I knew I had a chance at a triple. I waited till my little brother shot the first one with his single shot and knowing there would be no chance of him shooting at the same one as me by the time he got another shell in his gun, proceeded to knock 3 of the cranes down in quick succession. We finished the morning with a loner that passed overtop of us 4 times before David was able to knock it down after the barrage of shots on the first 3 passes missed. Final count was 19 cranes and 2 geese. 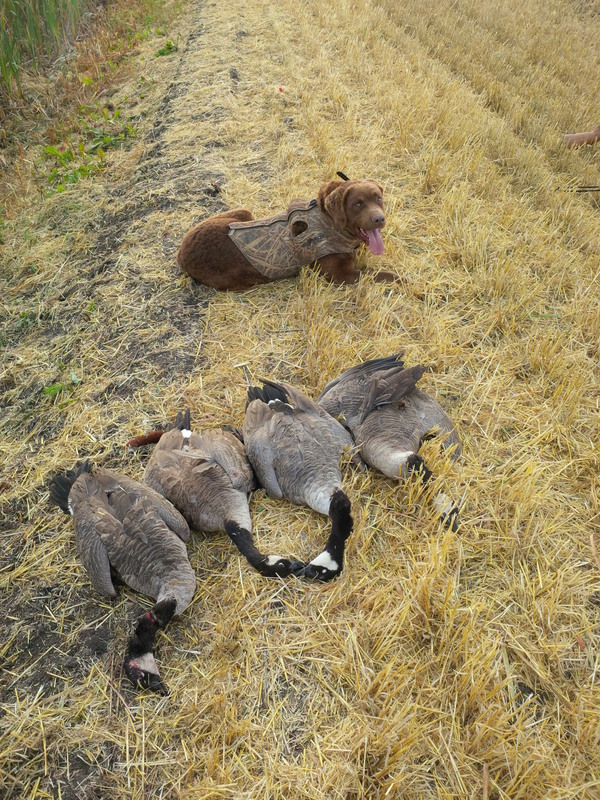 I had to leave the chessie at home as wounded cranes and retrievers are a bad combo, which I thankfully found out before I ever tried taking him on a crane hunt. 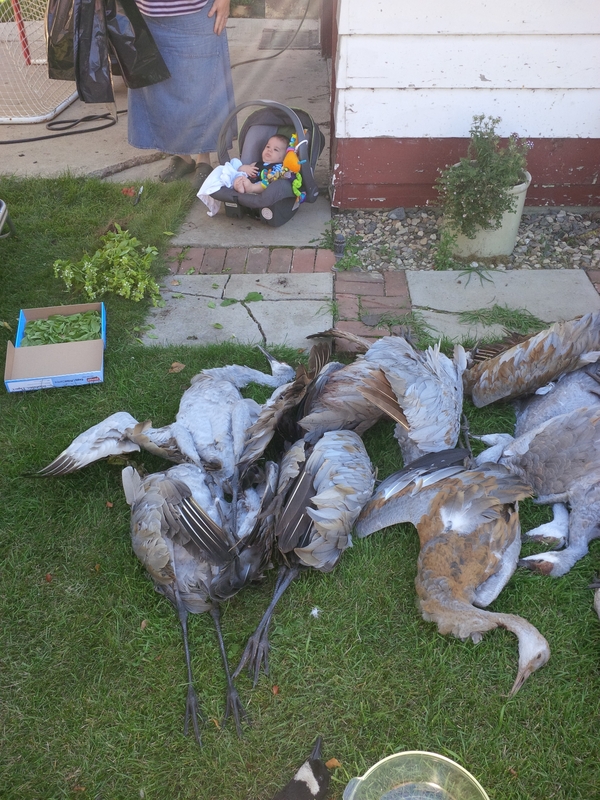 Zachary with his first ever sandhill crane. Cleaning birds became a family affair as even the 3 month old got involved. We will be keeping an eye on the cranes this week and see whether the snow geese finally decide to show up in force. My old call was a convoluted affair of a open cab tractor fender mount weather resistant stereo. Hooked up to a 12 volt battery along with my old 2nd gen ipod nano with transmitter it worked for a few years, but this year I realized it had lost a lot of sound volume and quality and it was time for an upgrade. This fully portable PA speaker with built in amp was only $50. It will run off of AC power (I would need areally long extension cord when in the field…) or 12volt DC (much more practical…) Takes 1/4″ audio input, the only thing needed to run this with an ipod was an adapter from 3.5mm audio plug to 1/4″ audio plug. It even has USB and SD ports in it and will play files off them. It also has plugs to run another speaker off of it. For $50, this was a no brainer, my amp and speaker were already paired together, in a somewhat weatherproof form, easy to hook up the audio to, easy to run another speaker off of and ran on 12 volt power. I ordered it and was fairly happy with it. One of the 1/4″ inputs is not very loud, not sure if mine is defective a bit or if that’s the way it should be. I only need one plug, so it’s irrelevant. It is very loud!! 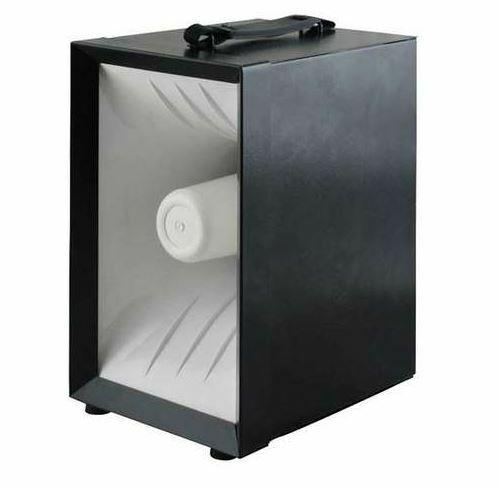 Audio quality isn’t awesome, but I don’t imagine its any worse than any other PA speaker out there. 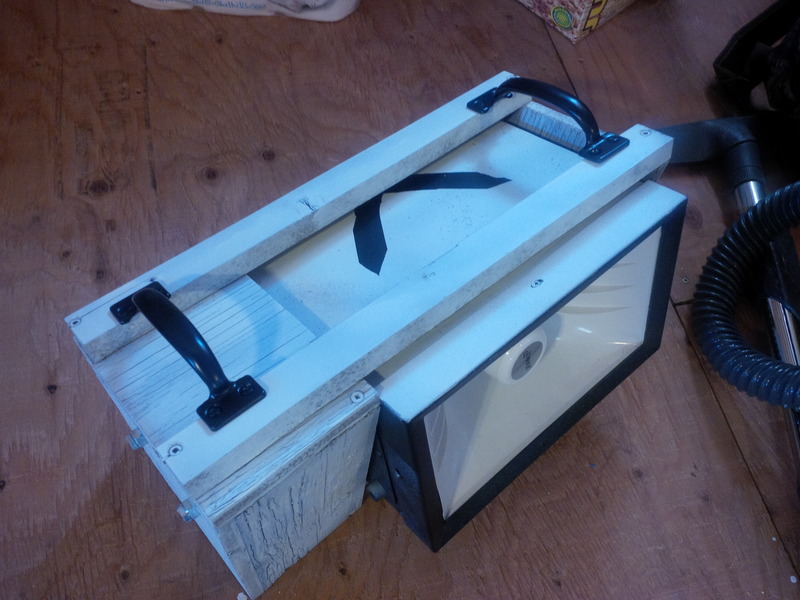 I got a 12 volt motorcycle size battery and built myself a box from some leftover treated plywood. 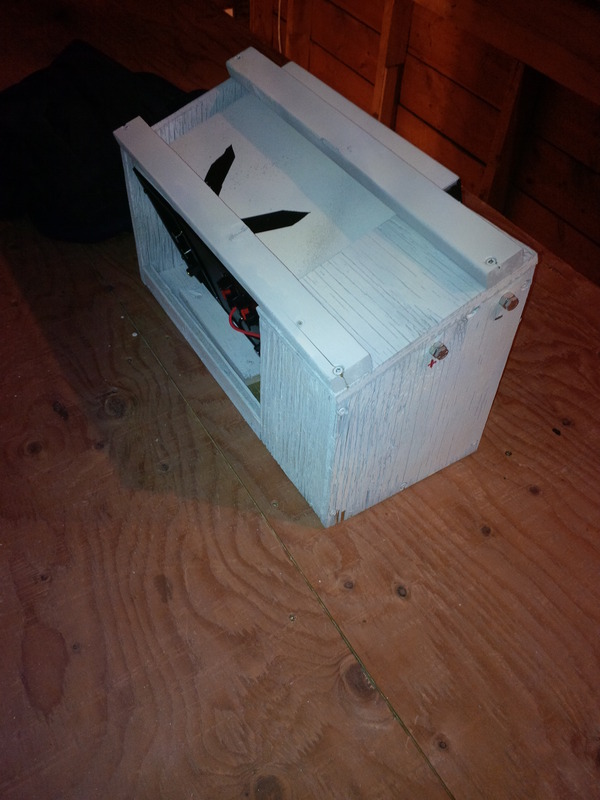 I wanted to fully enclose the battery if possible and put charging posts on the outside of the case. 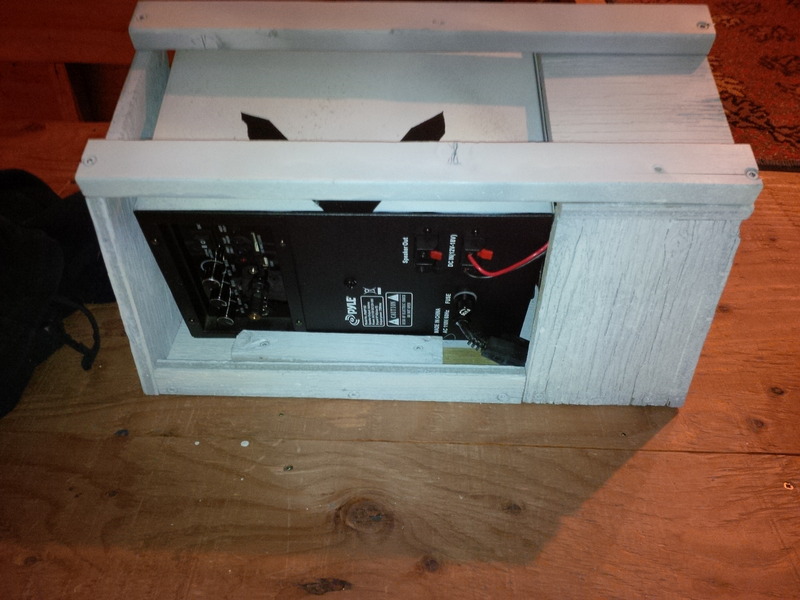 (too hard to get the battery charger on the battery posts on my old caller) I also built it to angle the speaker a little bit up so its not totally horizontal. So the plan is to run it with one of my ipods on a 50 ft aux cable so I can control the volume from wherever I am in the spread. I’m sure I could go with a remote of some kind, but then there is more cost added. I’ll try it with the long aux cord in the spring and if we have problems, then I’ll deal with it. I’m not completely confident that this thing is weather proof, on a rainy day I will likely wrap it up in a plastic bag to keep water from getting into it. the ipods I have laying around that I don’t use anymore. Well, I’ve been busy lately and haven’t had much of a chance to write anything new. I thought I would give an overview of the season. We got cold weather early in November and everything was frozen up solid by the 10th of November. Obviously some of the deeper lakes and the river were still open, but most of what the waterfowl would use was ice. We ended up with a total of 485 birds between 12 separate hunters on 64 hunter days for an average of 7.5 birds per person per day. 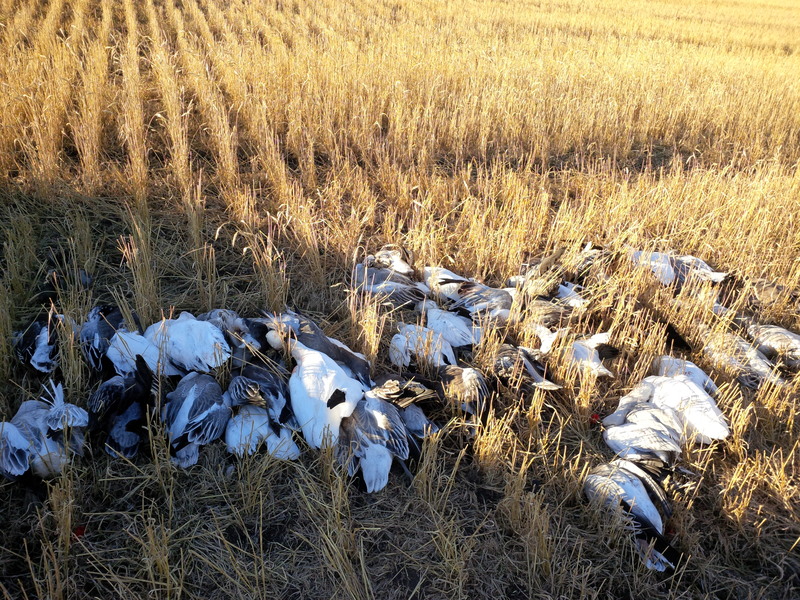 Of those 485 birds we shot 42 Canada geese, 346 snow geese, 83 ducks, and 14 cranes. I estimate about 150 of them ended up in our own freezer (no possession limit on snow geese anymore, but with a family of 3 we wouldn’t have come close anyways) with a lot being made into sausage and hamburger. We tried grinding some into burger on a whim and it turned out really good, nice texture, good flavor. I did not end up getting a deer this year, due to the last couple of cold, snowy, long winters our deer population has taken a big hit and seasons were cut back and a lot of people decided not to even hunt to give them a chance to build back up. We were out of hamburger and I kind of needed to get a deer this year, but using goose in place is working out really good. After hunting I have thought about how to improve my spread based on my experience this year. I would love to get a number of things but I doubt I will be able to get everything I want to get this year. At the top of my list is a new e-caller. My old homebuilt job with a fender mount tractor radio is on its last legs, does not have the volume and clarity it once used to have. I would love to get more decoys, more flyers especially. Laydown blinds would possibly be nice. A rotary machine would be interesting. 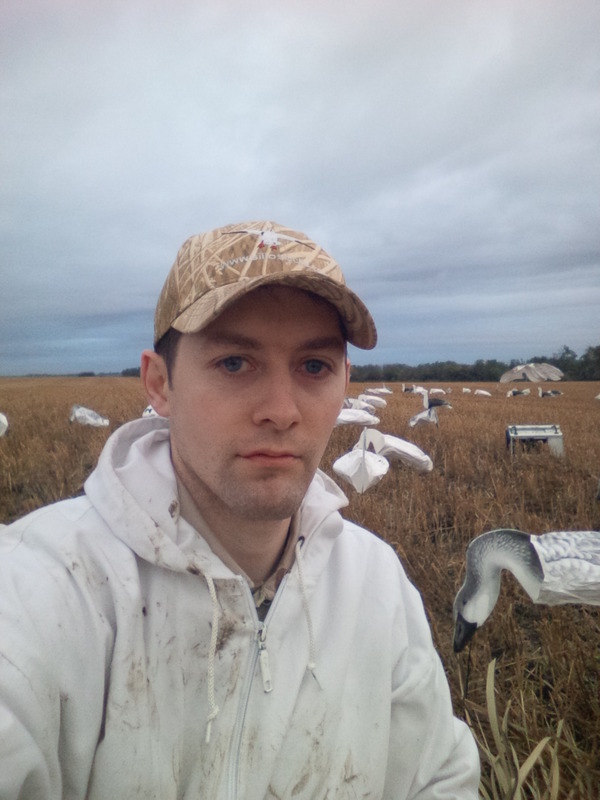 I currently have 144 snow goose sillosock decoys and a few flyers. I think we have 20 Canada shells and a dozen silloscks. I bought a dozen duck floaters that I can modify with rods into easy field use in addition to 4 we already had. laydown blinds would be $150 each, would need 3 probably. We will see what I am able to do this year, but I know I won’t be able to do all of it. I have alrady started on the e-caller, stay tuned for a later post. The fog hung thick and heavy, hardly allowing me to peer past the edges of my decoy spread. I clung to the hope that it might dissipate as the sun rose. That hope would be in vain. A few flocks of ducks had burst through the fog over and around me and one flock must have gotten close enough to see the decoys as they circled again and came in, setting their wings for landing. I took what I thought were 3 well placed shots, the first duck faltered and I moved to the second, crumpling it. I carried on to a 3rd duck now directly overhead and missed. I quickly looked at the falling ducks and saw the first had regained its wings and was hurrying to catch back up with its flock but the second one hit the field behind me about 20 yards. So much for well-aimed… Still, 1 was better than none, but 3 is better than 1. I thought that perhaps since these ducks had found me and my decoy spread in the thick fog, perhaps others would as well. Those 3 shots, however, turned out to be my only shots of the morning. I could hear the cacophony of geese on the roost about a mile away. I would hear the odd flock flying past to the west or south of me. Some seemed to be right in front of me, seemingly invisible in the fog. Strain as I might, I had yet to glimpse a snow goose this morning. 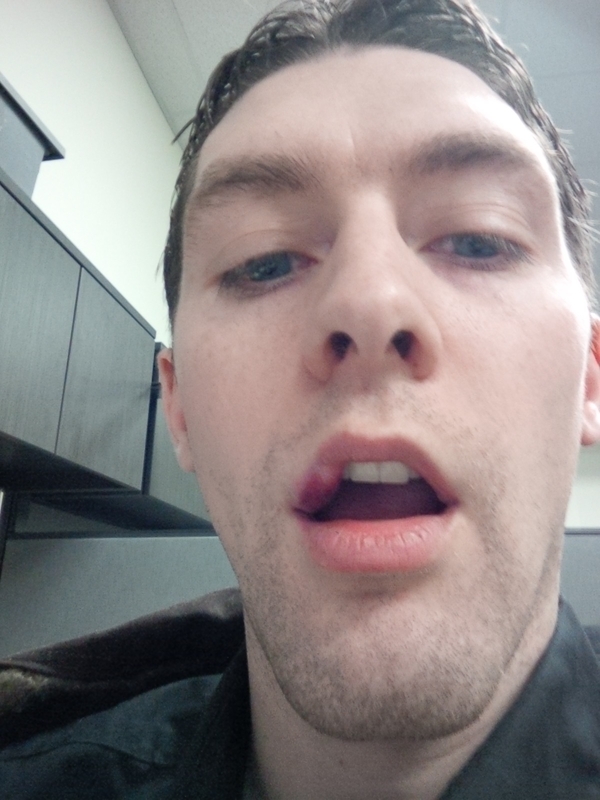 The looming reality of having to go to work kept creeping up, until I could not ignore it. I could still hear the majority of the geese on the roost. The thought came to me: “If I want to see a snow goose this morning, I should start packing up.” So often it happens, that some of seemingly most eager flights come after you have decided that nothing else is going to fly past that morning. I shoved the thought aside and went back for the truck, resigned to having to work for the rest of the day. I was scarcely 50 yards from my spread when I heard some geese start lifting. I waited, hoping I would hear them get closer, but they did not. It got quieter and I resumed my walk for the truck. I pulled the truck into the middle of the decoys and started picking up the decoys. I had picked up and stowed the first handful of decoys, when I heard them coming, low and eager, thousands of hungry snow geese. They broke through the fog and saw me and the truck at that instant. They turned away, coming back around to land in the field 200 yards short of me. Another flight came in from the other direction, they too broke as soon as they saw the truck, deciding that the real geese without the truck parked next to them and the human picking up decoys were a better option. Oh well, there’s always next time… At least I didn’t get skunked. As the season is winding down around here for snow geese, I figured I would try and figure out some numbers in regards to juvenile snow geese. So apparently this year had a really good hatch (or bad if you’re the tundra or a farmer). 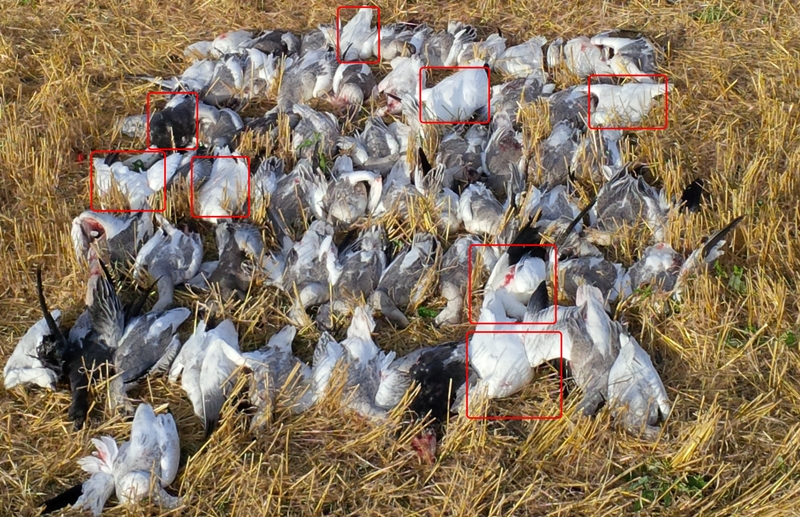 If that article is to be believed, then 60% of the snow goose flocks would have been juveniles. I didn’t think it was over half, but I wasn’t counting, that was just my impression. The juveniles made up a good portion of the flocks and there was nothing really noticeable in numbers between adults and juveniles, so half is easily believable for me. Numbers like that make me wonder how much the snow geese numbers increases each year and what their mortality rate is. I did not keep close track of adult snow geese that we shot during the season. But I did keep rough track some hunts and looked over pictures and counted out the best I could. Out of the roughly 350 snow geese that we shot this year I had figured that only 5-10% of them were adult snow geese, either blue or white phase. Looking over the pictures that I could tell, and using those figures for the rest of the hunts, I would say we shot around 35 adult snow geese. Basically 10 % would be the number of adults that we shot this year. What does all that mean? I have no idea… I’m not a biologist and I’ve never really looked at these numbers before this year, so I have nothing to compare it to. 8 out of 62 geese on this hunt look to be adults. Only 1 adult blue phase goose, the others white phase. I do know that pretty much all we shot the first couple hunts were juveniles. It seemed that as the season went on and we were shooting less birds, we were shooting higher ratios of adult birds. The juvys were either starting to get wise or the majority of the birds in the area shifted and was mostly adults as flocks moved south. I think it was likely a combination of the 2. I do know that this year was definitely the best year we had hunting snow geese, but we also tried a bunch of new things. I will definitely keep track in the coming years and see what’s what. This also reinforces my experience that adult snow geese are extremely smart birds and hard to hunt. I did a quick scout on the way to church the night before and there were quite a few geese going into a field owned by a cousin of mine. A co-worker of mine kinda wanted it held until some guys he had coming in from MN got there in the middle of the week. As we had shot plenty the week before, I was cool with that, we decided to set up on the next field and catch the curious ones. We set up on a beautifully clear morning with myself, and my good friends David and his 2 boys, Joel and Zachary. There was just a slight breeze from the south and the flock would be on the field to our west. The geese came in well before light and checked us out first before settling into the field west of us. Just about could have knocked a few over the head. As we waited for light, I utilized the time by videoing a bit. As you can see, a lot of willpower needed to wait until legal light. I decided I would shoot on the earlier flights when there was less light and more birds and then video later in the morning. We had some awesome shooting on some flights coming in nice and close. David’s youngest boy Zachary had just bought himself a brand new Stoeger over/under and was enjoying himself immensly. He definitely had a few birds to his credit that were his alone. He made a good shot on a distant Canada that faltered and then spun down about 100 yards later. As it got lighter and our bird tally was getting higher, I started videoing. Yeah, I need to work on my videographer skills, but hey its just my cell phone… On this next clip, you can see me put the phone back as a loner came back while they were loading up, so I quickly shot it. Some good shooting here as Joel knocks down 2 with his first shot. And this is probably my best footage of the day. 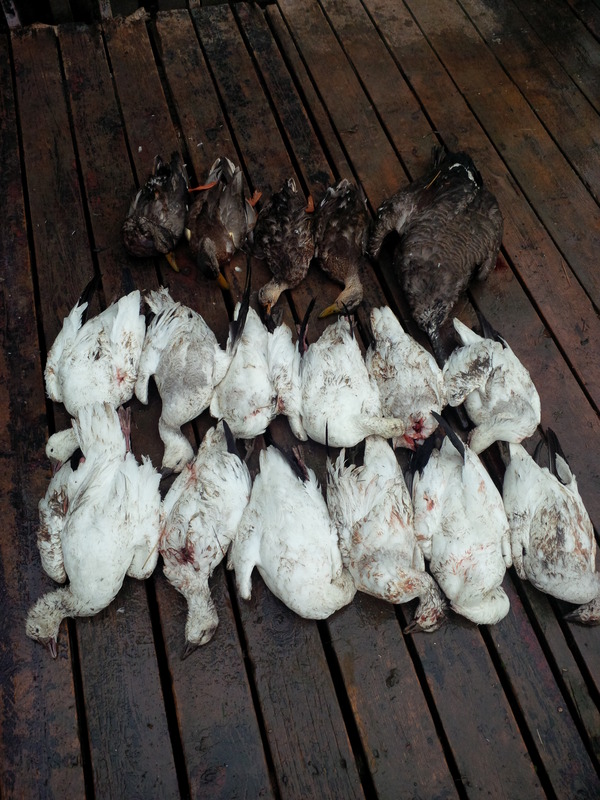 All told we ended up with a beautiful morning, 37 snows and 5 Canadas. I took 2 blue geese home for the freezer for possibly getting mounted. They definitely weren’t the best ones I’ve seen, but pretty nice. I’m just trying to get caught up here so I’ll throw a bunch of hunts in the same post. After our moderate success from the week before, I figured we would have some really good hunts this week. Several factors played into this. 1. There were starting to be a lot of snow geese 2. They were coming in earlier than usual, meaning outfitters didn’t have hunts booked and hunters coming up from the US on their own weren’t around either. 3. 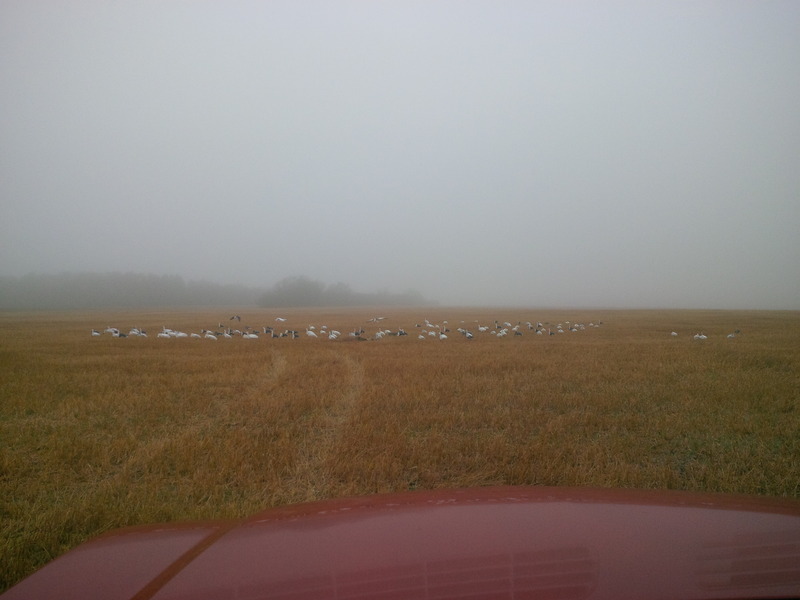 Harvest had had a slow start, leaving very few fields for the geese to go to, giving us a higher concentration. 9/16: We left them alone on Monday for some unknown reason. I scouted and found them going on a pea field about 7-8 miles out of town. There was quite a few on the field and I got permission to hunt it easily enough. My little brother did not want to hunt as he had been working long hours. I thought he should come hunting as the field that he would be combining that day was the next field over. He could have literally got out of the blind, walked 400 yards to his tractor and started greasing it for the day. Oh well, his loss. So it was just me and my dad and we knew that we should easily be able to limit out on the snows, even though we had never limited out on snows. 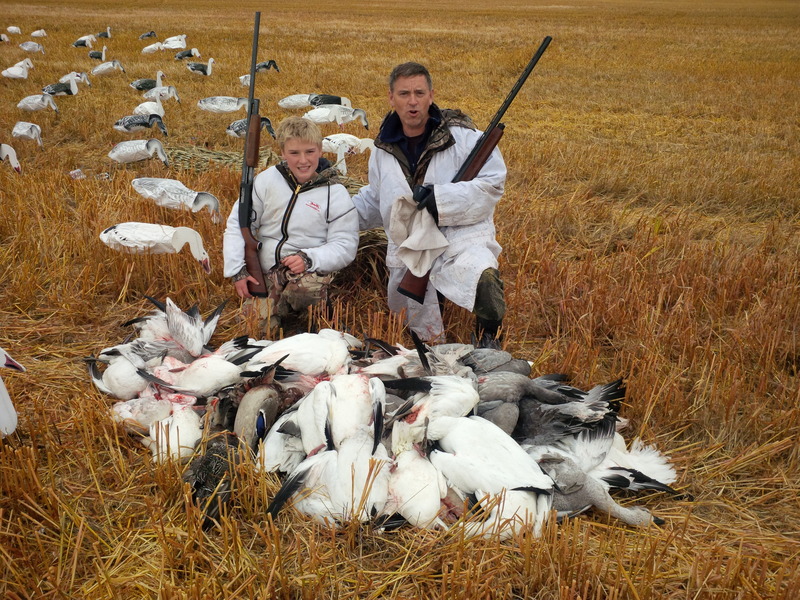 We knew that this was likely the only year we would be able to do this as I have heard rumours that the daily limit for snow geese will likely go up from 20 to 50 in the near future, leaving a daily limit pretty much unattainable. We set up our 150 sillosocks in the middle of the pea field surround about 10 yards of tall grass to set up our blinds in. The geese were flying over 15 minutes before light. Luckily the first ones to try landing were right at legal light and we opened up on them. 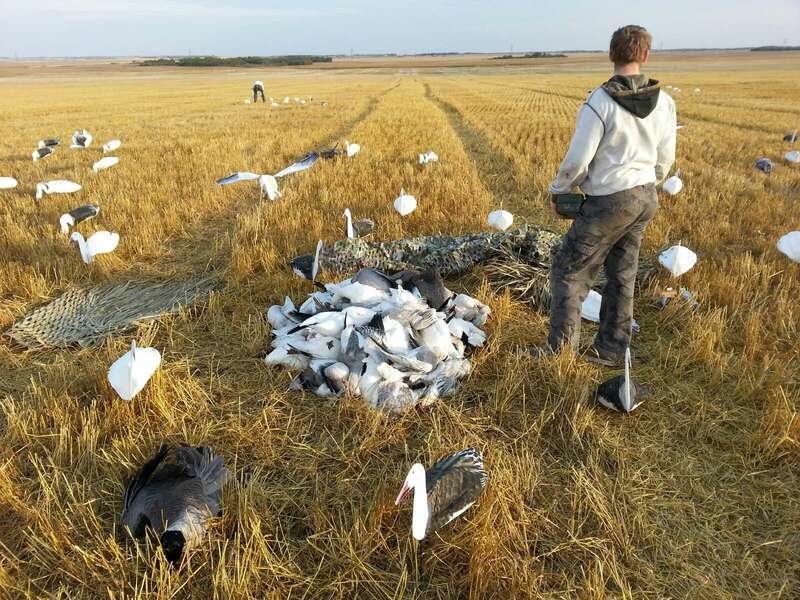 What followed was up to that point our best day of hunting ever as flight after flight piled into the decoys, direction not mattering as the wind was pretty much nil. We were getting close and did a count, 36. We knew we had one down further away, so dad went to get it and I sat in the blind waiting for 3 more geese which I was able to shoot by the time dad returned with the other goose and the truck. As we were picking up, the geese were still trying to land, just about hitting the truck in the process (well not quite, but probably flew within 15 feet of it, only 6 feet off the ground) We added 4 ducks to our tally of 40 snows. Here is the obligatory 4-0 picture… I’ve always thought these pictures kind of tacky, so I’ll probably only do it once in my lifetime. 9/20: So after 2 days we headed back at it. 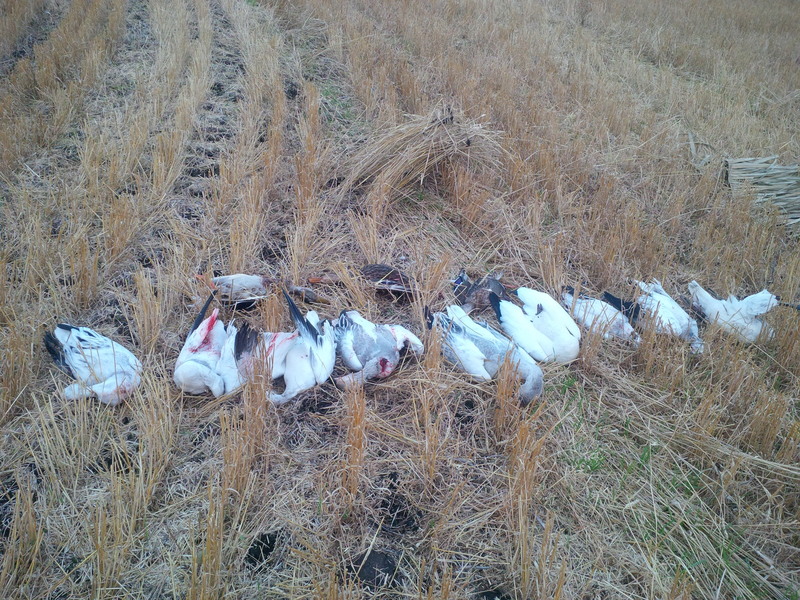 I had found a barley field with a good number of snow geese on it and we set up on it. By this time, there was starting to be a few trucks and trailers driving around and the birds were starting to be hunted more. The first field I had wanted to hunt was taken. Again 4 of us set up, me, my dad, and 2 other buddies. True to form, the snow geese were there to test our endurance before legal light. Once legal light came and the shooting started, the geese started landing a couple hundred yards north of us, but lots of smaller flights started hopping over to us. I noticed a truck pulling into the field and start coming along the edge about 400 yards away from us. I could hear shooting north of us and figured that he was probably sent by an outfitter to spook the geese back to their setup to liven their hunt up a bit. I was not impressed. We discussed a few options, but he finally drove out and left us alone. It was not going to be my only encounter with impolite, inconsiderate hunters that day. As the morning progressed, I pulled out my camera to try filming. I quickly realized that my digital camera was not suited for it and that my cell phone was a lot better. Here is a clip from my camera of a goose that I had to roll out of the way of. Here is a clip from my cell phone. We will refrain from posting more video from that morning due to embarrassment… Final tally from the morning was 62 snow geese. 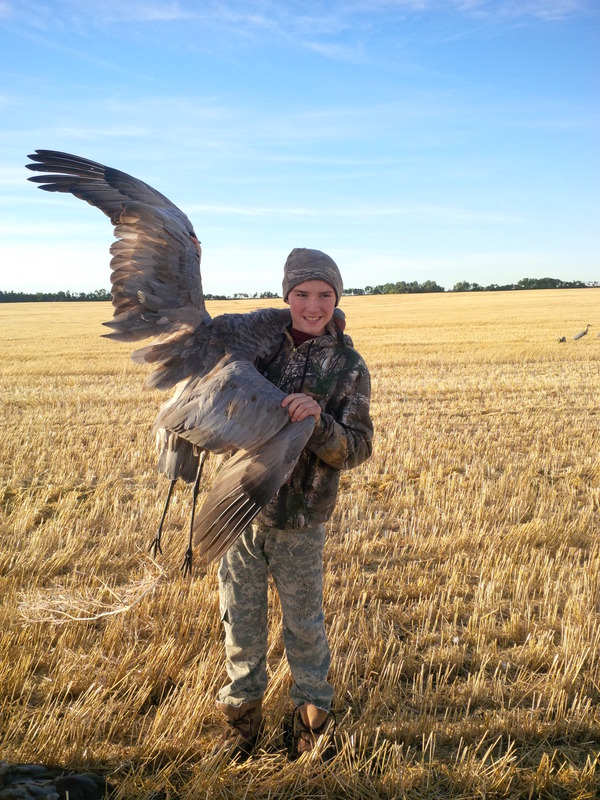 Evening: I wanted to see what was happening in the evening and wanted to see if I could get a nice blue goose. I got permission to hunt a field down there and when I got there it was covered as it the snow geese were using it as their afternoon roost. I snuck into a corner of the field and set up for the evening. I was just about done when 2 trucks and trailers came barreling into the middle of the field scaring half the geese and started setting up about 300 yards from me. After talking to the landowner a few days after, he said he told them they could only hunt it if I wasn’t hunting it. They knew what I was driving, had already passed me and had to come back past my parked truck which was visible from the road… Well I was determined to not let them outshoot me even though it was a slow evening. I had very few birds come to my spread as they had to pass the other guys first, but I made good on the ones that came my way. I took a total of 12 shots, getting 7 geese and only 2 more made it past me. They probably ended up with 20 between about 5 guys and a pile of shooting, so I felt I had outdone them. I have no idea if they felt that way or not. Thus ended our best week of snow goose hunting. The next weeks would entail trucks, trailers, and hunters from everywhere. Our tally over 4 days was 237 birds, over 18 birds per person a day. Needless to say, freezers were starting to fill up.